A solo show organized by three different major art galleries in Paris (St Germain-des-prés district) : Jeanne Bucher Jaeger Gallery, Le Minotaure Gallery and Alain Le Gaillard Gallery. From November 18 to January 14, 2017. Curator : Matthieu Poirier. Not only did Vera Pagava (Tiflis, 1907– Montrouge, 1988) limit herself to the painting, that antediluvian constraint of a wooden panel or a canvas over a stretcher, but she also narrowed her focus to oil painting, and, up to 1960, to genres as traditional as the still life and the landscape. And yet, against all expectations, her art is highly singular, combining formal purity with luminous intimacy. The artist developed this very personal pictorial universe with unfailing constancy and determination, always defying pictorial practices that, setting out to give life to a form of painting that modernity had declared dead and buried, often tended towards the spectacular, whether by expressiveness of touch and the use of more modern mediums such as acrylic, or by recourse to emphatic formats. She came to Paris from her native Georgia and enrolled at the Académie Ranson. There she was taught by Roger Bissière and forged un unshakeable friendship with Viera da Silva. Vera Pagava gradually constituted a vocabulary made up of minimal elements, extremely simplified composition and minimally rendered of details. As of the late 1930s, she stood out for her marked taste for Italian primitives such as Giotto, Cimabue and Fra Angelico whose skies, architecture and schematic, pre- Renaissance perspective, as one might call it, was, she felt, suited to rendering a form that was spatialised but not illusionistic. She also used its layered space, palette of pastel tones and filtered luminosity. The influence of contemporaries such as Max Ernst, Giorgio De Chirico and Yves Tanguy was just as notable, this time in her desire to bring into being a strange world devoid of any obvious narrative or meaning. This logic still obtained after 1960, when Pagava came to see figuration as nothing more than a crutch; this was when the break with the referenced subject, which had been long coming, was finally consummated. While the titles she gave her paintings still evoked real places, their presence was now merely indexical, an evocation rather than an identification of a referent, in a constant oscillation between pure abstraction and representation. Her work from this period is also reminiscent of practices ranging from Hilma Af Klint to Alexander Calder, oscillating between the mental structures of geometry and the curved entropy of life forms. Above all, however, it is a luminous vibration and a silent suspension of forms with characteristic outlines and vaporous surfaces based on heavily bodies, detached from both the terrestrial regime and the signifier, bodies that spread across a space which is at once frontalised and without limits, a world whose silence and intensity are matched only by artists of such stature as Agnes Martin, Mark Rothko, James Turrell and Anna-Eva Bergman. Where William Turner transcribed the dazzling light of the sun and Robert Delaunay and Giacomo Balla painted the radiance of electric light with its bright colours and sharp rays, Vera Pagava preferred an indirect, almost subjacent light, as if filtered by several layers of oil paint. She worked with great constancy on a single form, one with subtle chromatic palpitation, its light veiled by a pointillist mist and always indirect – a light, in fact, that is hardly retinal, but more internalized: Lagune de Venise (Lagoon of Venice, 1966, Musée des Beaux-Arts de Dijon), for example, is simply a gentle, coloured mutation, from the blue of the water to the yellow of the sun, in which the surface is simply an atmosphere, champed by myriad dots of colour, a pure halo, freed of its kernel, in which the colours are beaded with muffled light. Pagava’s eloquent silence is thus a kind of intimate communication, beyond language, spoken without the aid of signifiers. The mostly descriptive titles evoke, say, a lagoon, a city or a cathedral, a still life, a simple stone or perhaps a battle, but they are in reality false leads: the viewer’s relation is strictly to the painting, and the experience that ensues is perfectly autonomous. With the floating periods of his Les Origines series, made in around 1910, Paul Sérusier was trying to attain “an equilibrium that anyone looking at the work can feel […] in any culture or period.” And that is the objective, too, behind the suspended triangles of Pagava’s Coïncidences (1972) or her Cîmes (Peaks, 1978), an objective that they pursue in an essentialist vocabulary in which form is no longer the vector of a narrative but the expression of a simple formal tension free of anecdote, and universal in its scope. 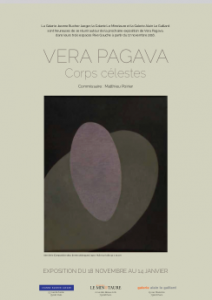 The artworks shown belong to the AC/VP (Association culturelle Vera Pagava), in charge of the preservation and promotion of Vera Pagava's work, and the Jeanne Bucher Jaeger Gallery.